I have included this page as Diatomite was used to manufacture a particular type of fire brick. Diatomite has a wide variety of uses, and is a component in hundreds of products, or vital to the manufacturing process of thousands more ranging from beverages, sugars and cosmetics to chemicals, industrial oils and paint and explosives. There were Diatomite mines at Inver Tote, Skye. There is no apparent evidence to suggest that fire bricks were manufactured at Inver Tote but it is possible that the Diatomite mineral was transported elsewhere to be used in fire brick manufacture. However in saying this Canmore details a kiln found at Inver Tote and states that the column / chimney of the kiln had a fireclay brick lining. 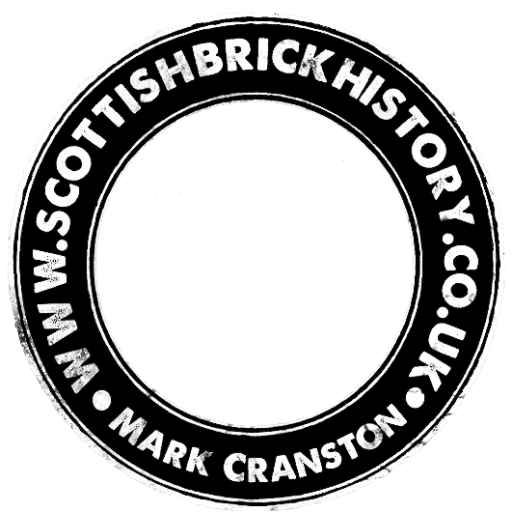 The bricks were manufactured by Star Works (Glenboig, Lanarkshire) and Etna Works (Armadale, West Lothian). 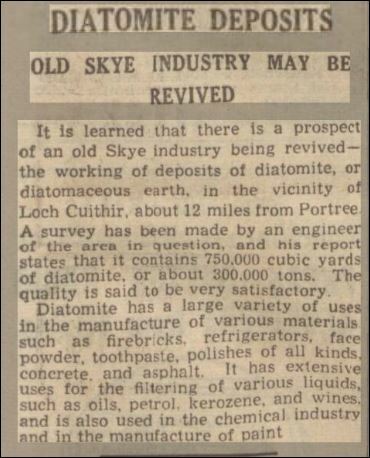 28/04/1886 – Glasgow Herald – Article regarding the recent finds of Diatomite on Skye. The mineral depsoits are remarkable both in point of quality and quantity. The localities where it is found in abundance are Loch Quire and Loch Columbkill and small quantities in Glen Snisdale and Sartil. It refers to diatomite being used for siliceous glazes for pottery ware. 29/09/1886 – Aberdeen free press – Further article on the Diatomite finds on Skye – …it can be adapted for the formation of light bricks, in certain cases most useful; they can be made so light that if glazed they will float on water while their strength equals that of ordinary bricks. 16/02/1887 – Shields Daily News – Steps it is said will be shortly taken to start Loch Quire Diatomite Works ( Skye). The company are about to lay a tramway from the loch to the seashore, a distance of about 3 miles. Below – 23/06/1887 – The Scotsman – Article describing how diatomite is processed and the buildings and structures reuired. A kiln is required for drying peat. Below – 30/01/1939 – Edinburgh Evening News – Refrence to Diatomite being used in the manufacture of fire bricks. Below – 05/03/2008 – Stornoway Gazette – In the Trotternish area of Skye, taking the Staffin road out of Portree, travellers will pass the Storr Rock, and then after continuing a further five miles or so, arrive at a lay-by near a gorge with a sign pointing off to the left, indicating the small community of Lealt. There is a lot more to this area than first meets the eye, and it’s all down to a substance called Diatomite and even a brush with German espionage. Known to the locals as ‘Caile’ (Gaelic for chalk), Diatomite is a clay-like floury grey substance, found in certain freshwater lochs and suppling many minerals used in the production of numerous products, ranging from beverages, sugars and cosmetics to chemicals, industrial oils and paint. Trotternish was home to two mining areas – one in Digg, Staffin, and the other at Loch Cuithir in Lealt. Although little is known of the Digg mine, where production ended sometime after the First World War, it is the history of the Loch Cuithir mine which is of interest. Work began at Cuithir in 1899 and finally ceased over six decades later in 1960. Over the years, the mine saw periods of inactivity, but when up and running operations made use of the large industrial works at the area – a large factory building, a railway with embankment cuttings, and a rolling stock traversing three miles of landscape, including an aerial ropeway. The light railway was used to transport the Loch Cuithir Diatomite to the shores at Invertote for a final drying and grinding, and a large building containing a furnace, grinding machine and storage space was constructed there for this purpose. Such modernised business works were quite remarkable for this part of the world at the time. In those days there was no road between Staffin and Portree, so a puffer boat would anchor in the bay at Lealt, and local skiffs were used to transport the finished Diatomite from shore to boat, ready for shipping to the mainland. There were around 40 to 50 people steadily employed at Lealt, yet on days that the boat came in this total rose to as many as 80 workers. Perhaps one of the most intriguing aspects of the mine’s history comes from the ownership of the drying factory at Invertote by Germans. Although closed during the period of the Great War, surprisingly the now enemy forgein residents were allowed to stay on. Shortly afterwards a rumour began to circulate that the area was haunted, and that the ghost of a recent tragic death at the Lealt falls had appeared at the factory. As the local story goes, (the rumour was actually started by the Germans) with the intent of keeping locals away. It turned out that the resident Germans were spies and that, almost unbelievable to the communitiy, the area was being used as a German base with submarines surfacing in the sea bay! Moving on, the year 1950 saw the next development in the mining of Diatomite from Loch Cuithir. As the loch was one and a half miles up the moor, through peatbogs and rivers, the Department of Agriculture and Fisheries for Scotland (DAFS) decided that a road should be built, with the intention of extracting the Diatomite by digger, and then taking it to the Lealt road end above Invertote. The road took around a year and a half to build, during which the mine was put out of operation. Yet, when production started again, the new method of extraction did not reach the high standard of quality which was achieved when extracted manually by spades. The mechanical extraction resulted in the Diatomite being less pure, and full of unwanted dirt. Drying the substance is, in fact, the problem of the process, for it is obvious that in a damp climate like Skye, the diatomite does not lose its moisture quickly. The problems which began after the construction of the 1950s road were further highlighted and compounded six years later. A new factory was built at Uig (the site where the Cal Mac offices are now situated), far from the mining site at Loch Cuithir, and it may be said that this move was the ruining of the entire Diatomite industry upon Skye. As Diatomite was no longer dried at Invertote it now had to be transported by road, wet, for the much needed drying process to Uig, 23 miles away. A vehicle may have left Loch Cuithir carrying five tonnes of Diatomite, yet only producing one tonne of finished product after drying had taken place – a finished product which was also not as pure as it ought to be for the specialised work it had to do in various products. A lot of money was wasted on travelling, and within the factory itself inefficiency was also present, with machinery often breaking down due to the damp state of the Diatomite. Outside the factory, the scenic communities of Trotternish also began to suffer. When the factory was working, it poured out a fine white dust which covered every house in the area. Grass became chalky in colour and after dry spells in the weather, the road-sides from Staffin to Uig would turn white with Diatomite – Uig was constantly under a cloud of dust. With complaints of insubstantial profits and bad managment, the factory was finally closed to production for the last time in 1960. Yet, although the Diatomite mining industry on Skye came to an abrupt ending, it was still regarded by many locals as a blessing at the time. Following from World War One, the industrial works provided employment for many returning men who could not find work else where in the island. And at peak production, around 1955/56, 50 to 60 men were paid good wages to work at the factory.